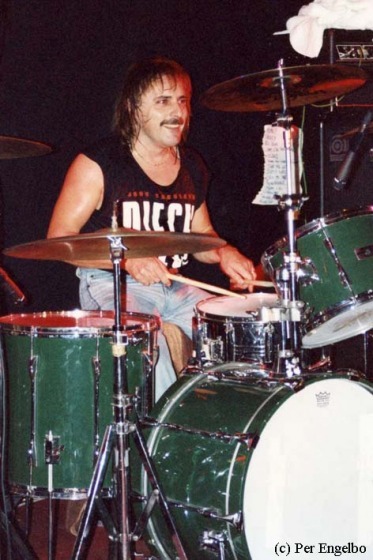 In 1976, legendary former Status Quo drummer John Coghlan formed the Diesel Band. The basic original idea was for John to play with various musicians who were available to do a gig. "It wasn't me trying to express myself or that crap, I just felt I had the energy to do it. I got so bloody bored just sitting there when Quo weren't working", as he explains. In the late 70s Status Quo were at their peak, so forming the Diesel Band was a way for John to get back a bit, playing smaller clubs and simply make some good rock music with a touch of the blues. The first ever gig they did together was at the classic Marquee Club in London in 1976. The band then featured John on drums, Status Quo's keyboard player Andy Bown on bass, Whitesnake guitarist Micky Moody, Medicine Head's John Fiddler also on guitar, Gordon Edwards from the Pretty Things on keyboards, Quo's tour manager Bob Young on harmonica and the infamous Jackie Lynton on vocals and general madness. They had rehearsed a one and a half hour set but ended up on the Marquee stage for almost three hours. John Coghlan, Bob Young, Andy Bown, Rick Parfitt, Alan Lancaster, Long John Baldrey, Bernie Marsden, Neil Murray, Dave Markee, Mike Simmonds, Phil May, Hilly Briggs, Chris Stewart, John Fiddler, Lemmy, Gordon Edwards, Jackie Lynton, Micky Moody, Ray Minhinnett, Leo Lyons, Don Airey, Charlie McCracken, Graham Preskett, Jim Rodford, John Verity, Andy Pyle, Gary Mowberly, John Gustafson and Mick Grabham. Probably the most famous of all the gigs the Diesel Band have played took place at the Marquee Club in London July 9th 1985, just a few days before the massive 'Live Aid' concert. For the first time since the split with Status Quo almost four years earlier, John Coghlan was joined on stage by his old friends Rick Parfitt and Alan Lancaster. The amazed and cheering audience really enjoyed themselves when three quarters of the original Status Quo played three songs together with the Diesel Band, "Roadhouse Blues", "A Mess Of Blues" and "Caroline". On stage the same night frontman Jackie Lynton announced that the band had spent some time in the studio prior to the gig, recording material for a possible album release. Unfortunately nothing was ever released from those sessions. 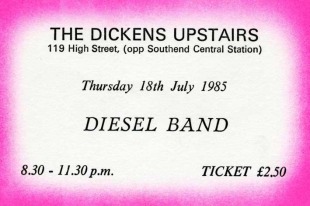 It took another six years until the Diesel Band did their first proper tour outside the UK. In early 1991 John Coghlan asked Bob Young if he could help him put a new band together. The two of them soon got a couple of old friends in. Phil May, originally with the Pretty Things, was recruited on vocals and rhythm guitar, Hilly Briggs from Sam Brown's band was brought in on keyboards and Chris Stewart from Frankie Miller's band on bass. The sixth and final member of this lineup was Ray Minhinnett, an excellent guitarist and great bluesman who used to play with Frankie Miller's band for several years. In 1991 Ray was nominated by the British Blues Foundation for 'Best British blues guitarist' alongside Eric Clapton, Gary Moore and Rory Gallagher. Bob and John turned to each other, "ok, now we've got the band, now what shall we do? Where do we want to tour?". They decided to go to Sweden of all places. The promotor Jörgen Wiking and his company, Showcase, arranged a tour in October/November 1991 covering the major cities in the middle and southern parts of the country. A lot of people, fans and media, were a bit surprised that a celebrity like John Coghlan went out on the road in Sweden playing 14 clubs in as many days. "First of all, the Diesel Band only play in clubs and smaller venues, so that kind of tour suited us perfectly. Bob and I also thought it would be nice to visit Sweden again, after all we had not been there since the Quo tour in 1981. It was about time", John explains. "We only have fond memories from touring in Sweden, the audiences are always fantastic there". During this tour plans started to emerge to finally record an album. The initial thought was to find a proper studio when the band returned to England, but after that first successful tour of Sweden plans began to change. "We had such a nice time in Sweden, so we all thought it would be a good idea to do the recording there as well. A month or two in Gothenburg couldn't possibly do us any harm, you know", says Bob Young. He continues. "The tour in October/November was really good, a lot of fun. We met a lot of nice people and simply had a really good time. After that success we decided it was about time to make an album". About time it really was. After 16 years as one of rock music's most fun live acts, the Diesel Band returned to Gothenburg to start working on their long awaited debut album, "Flexible Friends", in early 1992. "The Diesel Band has always been a band of musicians who just get together, you know. It's been very flexible over the years, and that's how we came up with that album title", Bob explains. Intended to be released as single number two from the album. A great rock song featuring a brass section. Excellent slide guitar work and lead vocals by Ray Minhinnett who also wrote the song. A promotion video was shot for "Turn Me Loose" with the band performing the track on stage (playback) together with some Swedish girls on backing vocals. Chosen as the first single. Even though it never officially made it into the record shops, there were some copies of this cd-single distributed in Sweden for promotion. A nice little ballad with a strong, catchy melody. Lead vocals by Phil May who also co-wrote it. A promotion video was shot for this song as well. 3. "One Way To Roll"
First class, hard rocking Quo boogie! Originally written for Status Quo by Bob Young and Micky Moody, but was surprisingly enough rejected by the band. Lead vocals by Bob Young. A ballad with Phil May on lead vocals featuring some really nice guitar work by Ray Minhinnett. Nice track with lead vocals shared by Ray Minhinnett and Phil May. This song, credited as written by all six band members, was intended as the b-side on the first single. The lead vocals are shared between Ray Minhinnett and Phil May. Rock and blues in a healthy combination. Originally written and performed by the American blues legend Tony Joe White, but probably made most famous by Tina Turner when she featured a blinding version on her 1989 album "Foriegn Affair". 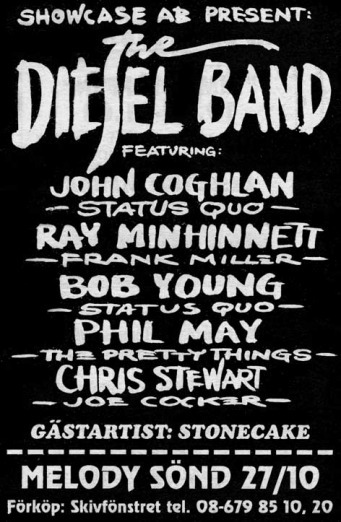 The Diesel Band's version, with Phil May on lead vocals, is quite similar to the one Turner did just a few years earlier. 7. "Living On An Island"
Probably one of the greatest tracks ever recorded by Status Quo, written by Rick Parfitt and Bob Young. This beautiful, slow and laidback version fits Bob's dark, husky voice like a glove, and Ray Minhinnett does some great guitar work. There has been a small change in the lyrics, Alan Crux's name ('Cruxie') has been replaced by 'Jessie'. A slow track, originally made famous by Ike & Tina Turner back in the 60s, which gives Ray Minhinnett a fine opportunity to show what a great blues vocalist he is. 9. "Ain't Got No Money"
This song really rocks, and it was used as a show opener on both tours in Sweden. Ray once again shares the lead vocals with Phil May, and there's also some great harmonica by Bob. Different than the other material, and it strums along with a quite strange rhythm. Even though Hilly Briggs plays some nice organ, the song never really happens. Lead vocals by Phil May. Without any doubt the heaviest track on the album. Lots of guitars, extremely powerful vocals by Ray Minhinnett, and John Coghlan keeping it steady as a rock. Throughout the whole album John plays in the same familiar way as we're used to since the glory days with Status Quo. Behind the kit he's the anchor man, the driving force who really lays it out straight and without frills. 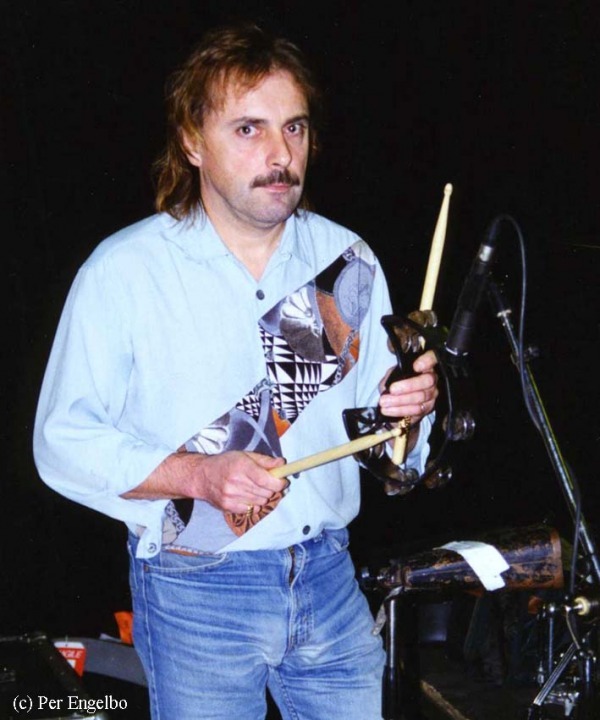 When we talked to Ray Minhinnett during the recording sessions he was full of enthusiasm, describing John's drumming as "some of his best work in many, many years". The work in the studio was done between January and March 1992, and the Diesel Band were also able to fit in a tour of the southern parts of Sweden between the recording sessions. This time the tour was promoted by Västfront Produktion. The album release was first set to April 1992, and it was supposed to be followed by another tour of Sweden and Scandinavia, Germany as well as some British dates. For unknown reasons the release date was then altered, and a new date was set to August. A tour was to follow the release, starting in Sweden in September, and finishing in England in December. After a few weeks back home in England, the band returned to Gothenburg April 30th 1992 to perform at an outdoor concert as support act to Santana. After that everything went quiet. The album was never released. Instead a bitter feud followed between the band and the production company, Västfront, about who actually owns the master tapes. Today the "Flexible Friends" tapes are locked away in a bank deposit box somewhere in Sweden, and despite several attempts to get them back, John Coghlan and his Diesel Band still wait for the release of their very first album.